Picture Mildred, Agnes, Ethel and Blanche. Perhaps you imagine the Golden Girls or your grandmother’s poker game. These are names for women of age, wisdom and distinction. 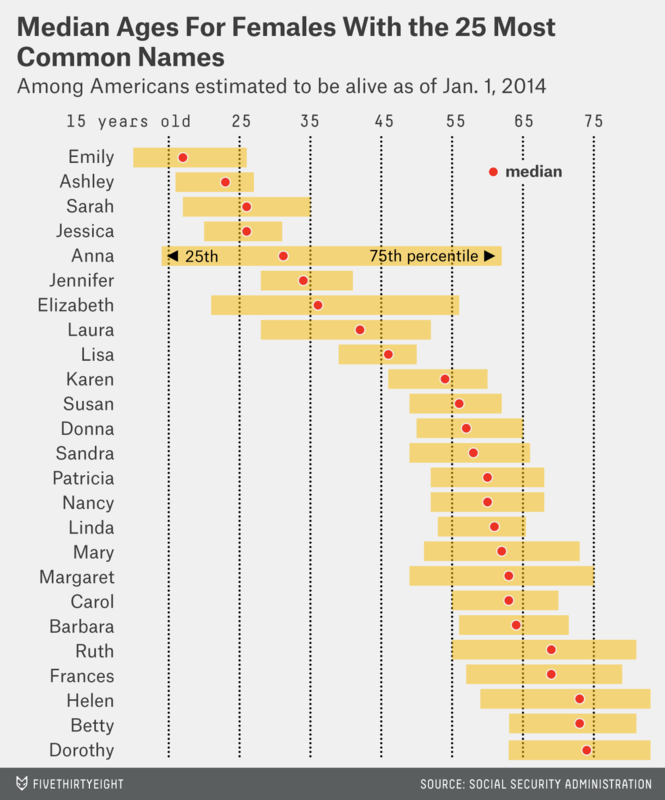 The median living Mildred in the United States is now 78 years old. Now imagine Madison, Sydney, Alexa and Hailey. They sound like the starting midfield on a fourth-grade girls’ soccer team. 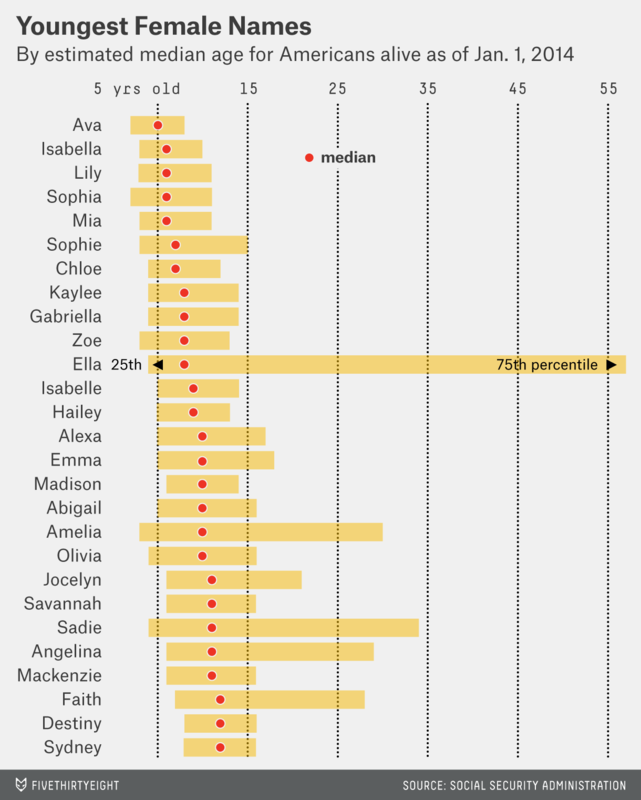 And they might as well be: the median American females with these names are between 9 and 12 years old. There are quite a lot of websites devoted to tracking the popularity of American baby names over time. (The data ultimately comes from the Social Security Administration, which records birth names dating back to 1880.) But we haven’t seen anyone ask the age of living Americans with a given name. 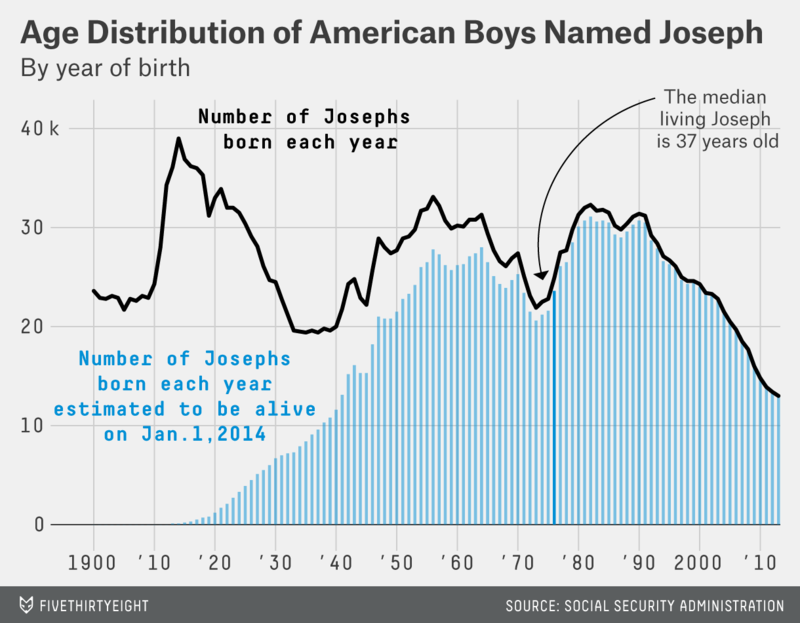 The peak year for boys named Joseph was 1914 — when about 39,000 of them were born. Those 1914 Josephs would be due to celebrate their 100th birthdays at some point this year. But only about 130 of them were still alive as of Jan. 1. We can run these calculations for any name in the SSA’s database — for instance, for the 25 most popular male names since 1900. 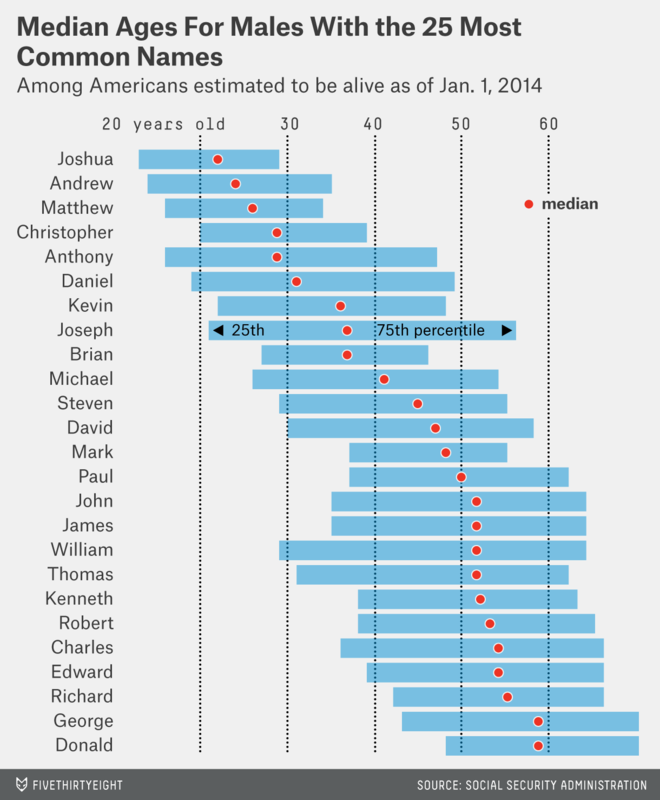 Joshuas, Andrews and Matthews are the youngest of these, with median ages of 22, 24 and 26. 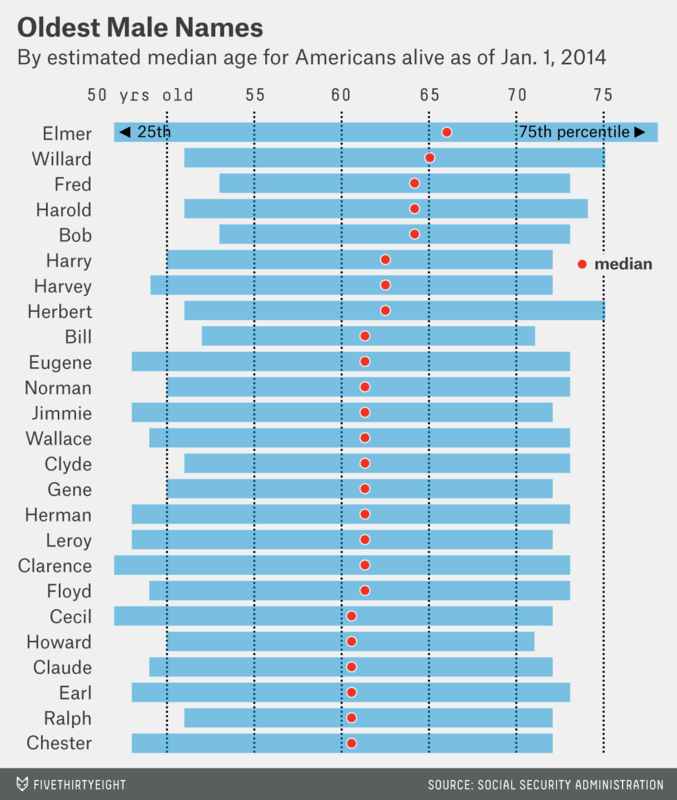 Georges and Donalds are the oldest, each with a median age of 59. The data for the top 25 female names is more dynamic. 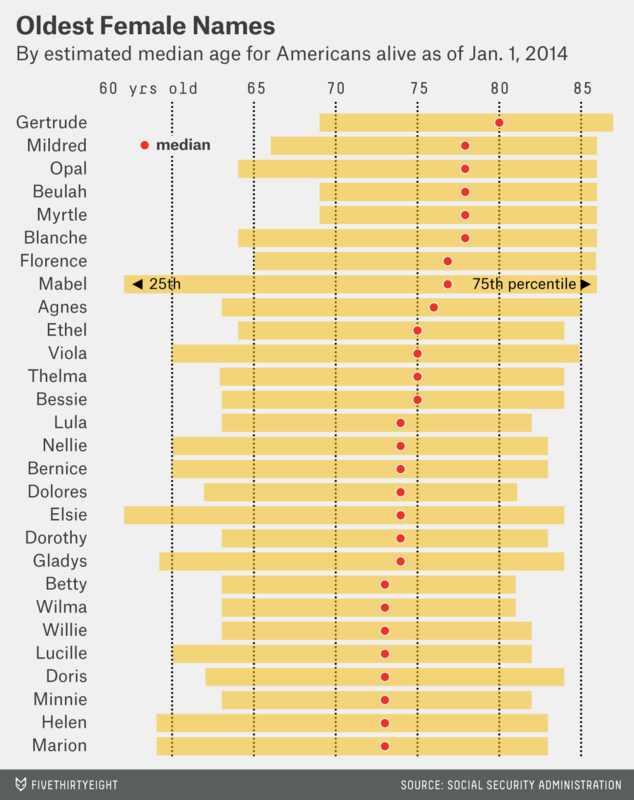 The median Emily is just 17 years old; the median Dorothy is 74. 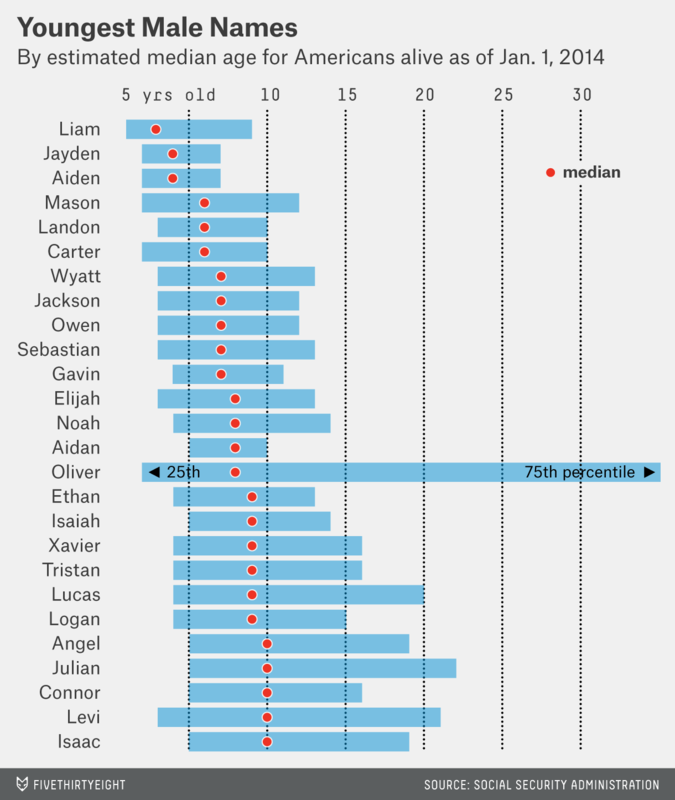 Girls’ names typically cycle in and out of fashion more quickly than boys’ names, which means that they have narrower interquartile ranges. For instance, almost half of living Lisas are now in their 40s, meaning that they were born at some point between 1964 and 1973. 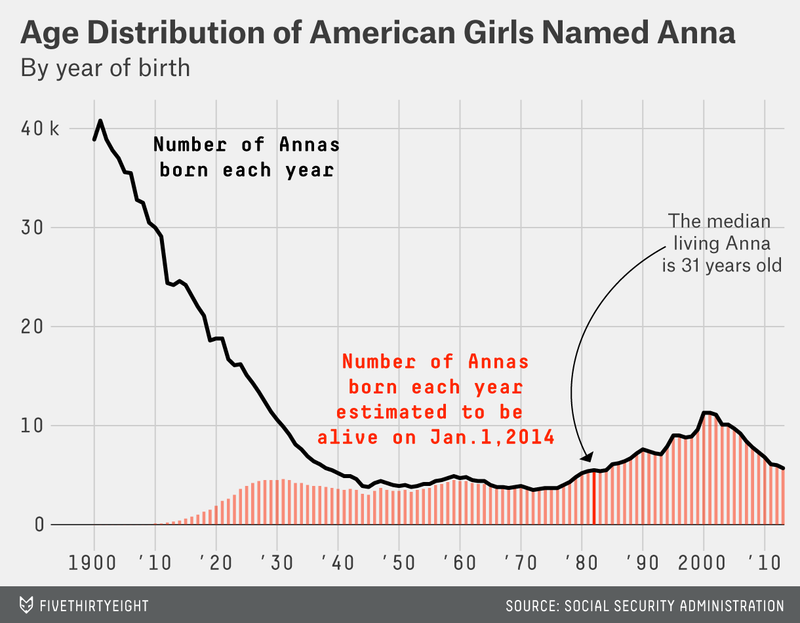 However, there are some exceptions — most notably Anna, which is a remarkably well-enduring girl’s name. The name Anna steadily declined in popularity from 1900 to 1950; however, many of those older Annas are no longer with us, and the name has remained at reasonably steady levels of popularity since then. 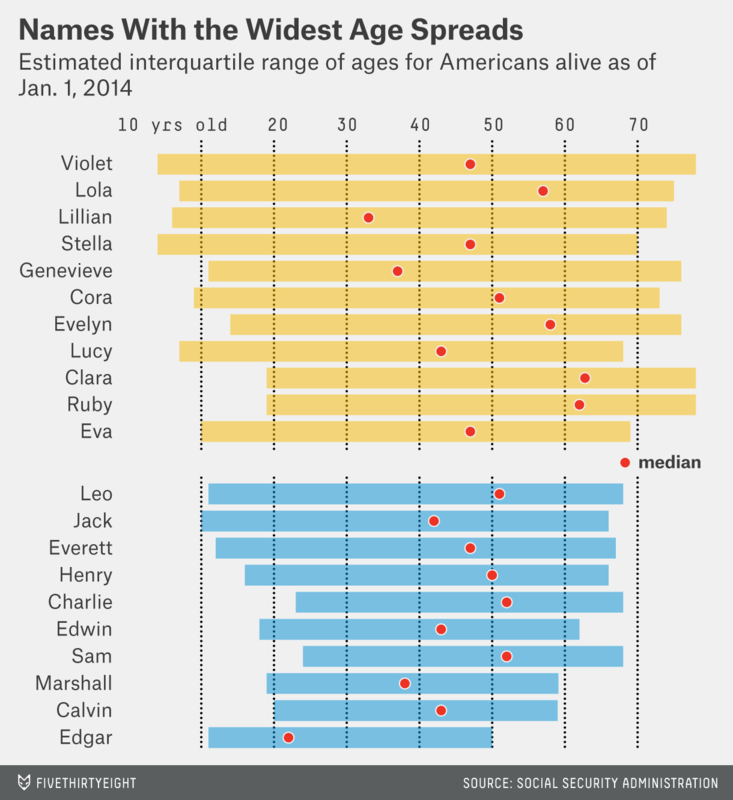 Thus, while a quarter of living Annas are younger than 14, another quarter are older than 62. By contrast, the majority of living Hermans, Howards, Harrys, Harolds, Harveys and Herberts are in their 60s, or older. And the oldest male name is Elmer, with a median age of 66. Eva, Mia, Sophia, Ella and Isabella might be friends with Mason and Liam in their kindergarten classes. The median girls with these names are between 5 and 8 years old. Other names have unusual distributions. 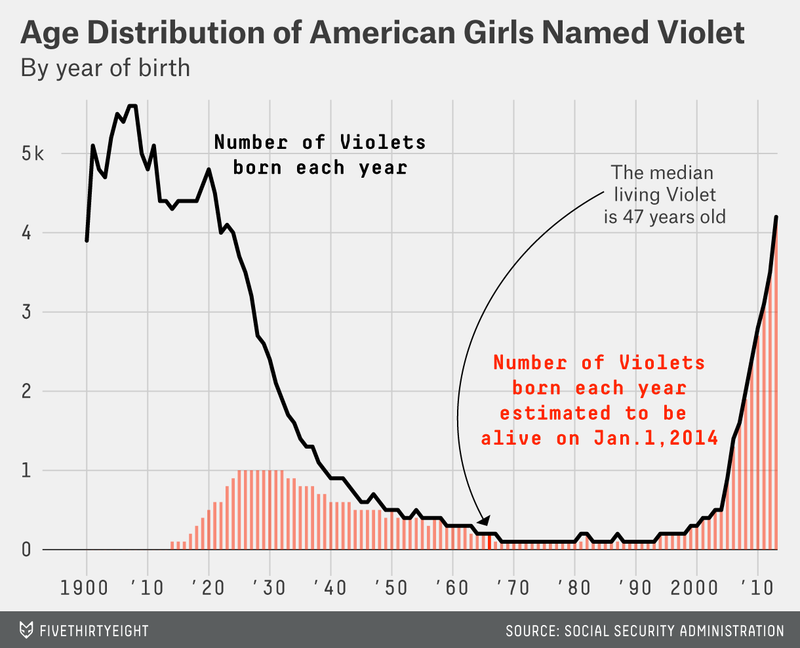 What if you know a woman — or a girl — named Violet? The median living Violet is 47 years old. However, you’d be mistaken in assuming that a given Violet is middle-aged. Instead, a quarter of Violets are older than 78, while another quarter are younger than 4. Only about 4 percent of Violets are within five years of 47. Lolas, Stellas and Claras also have highly bimodal distributions. This pattern is slightly less common among male names. But it does occur occasionally, perhaps partly as an unfortunate consequence of the movie “Titanic.” The two male names with the widest age spreads are Leo (as in DiCaprio7) and Jack (as in Dawson, the character he played in the film). Jack died in the end, so let’s end on a morbid note. Out of all Americans given a particular name since 1900, how many have since died? 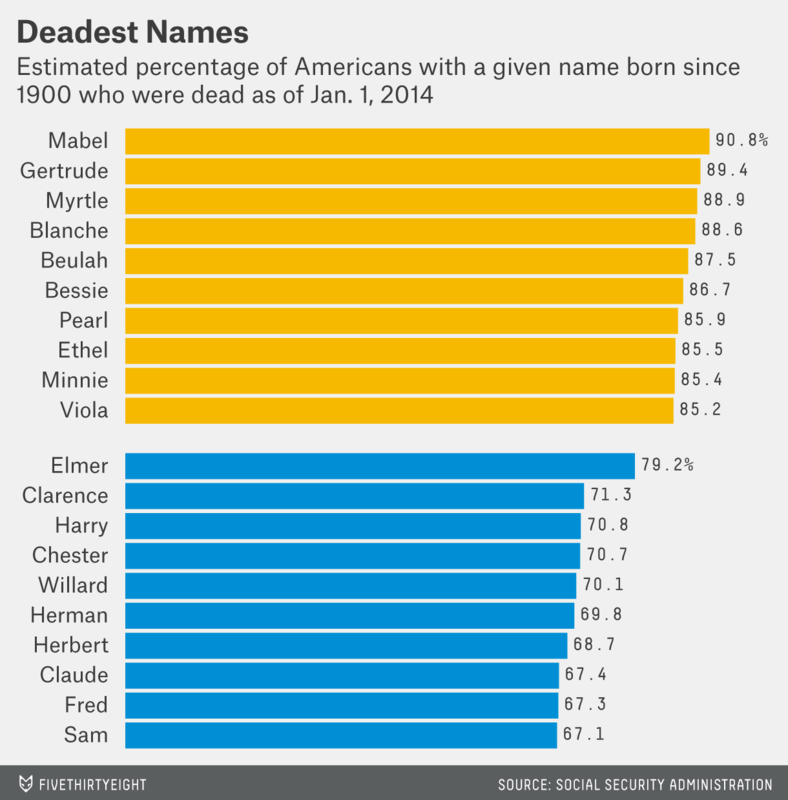 These results are highly similar to the lists of the oldest names, although slightly more Mabels (90.8 percent) have died than Gertrudes (89.4 percent). Elmer is the deadest common male name, at a 79.2 percent fatality rate. But if the list were liberalized to include more infrequent names, Hyman (91.3 percent), Eino (89.7 percent) and Isidore (87.2 percent) would do a better job of keeping up with the ladies, ’til death did they part. We’ve seen variations on it described elsewhere. The SSA’s actuarial tables are listed by decade, e.g., for people born in 1920, 1930, 1940, etc., so we used linear extrapolation for years that don’t end in zero. Or more precisely, were still alive as of Jan. 1, 2014. In practice, survival rates vary somewhat by ethnicity, class status and other factors, which are sometimes also correlated with first names. And almost all Brittanys are still living, god bless them. Second, the SSA’s records are not quite complete. Birth registration wasn’t mandatory in many states before the 1930s, and some parents still do not register their children even though they are supposed to. Thus, we prorated the baby names the SSA has on file in each year to account for missing records. We accomplished this by looking up Census Bureau records for the total number of live births in the U.S. each year. The data is sketchy for years prior to 1909. There is some evidence that the birth rate was higher in the 1900s than in the 1910s, which we accounted for, but it doesn’t make much difference in the analysis since few people born in that decade are still alive. The SSA also does not list records for name/gender combinations (for example, girls named Sam) with fewer than five births in a given year. 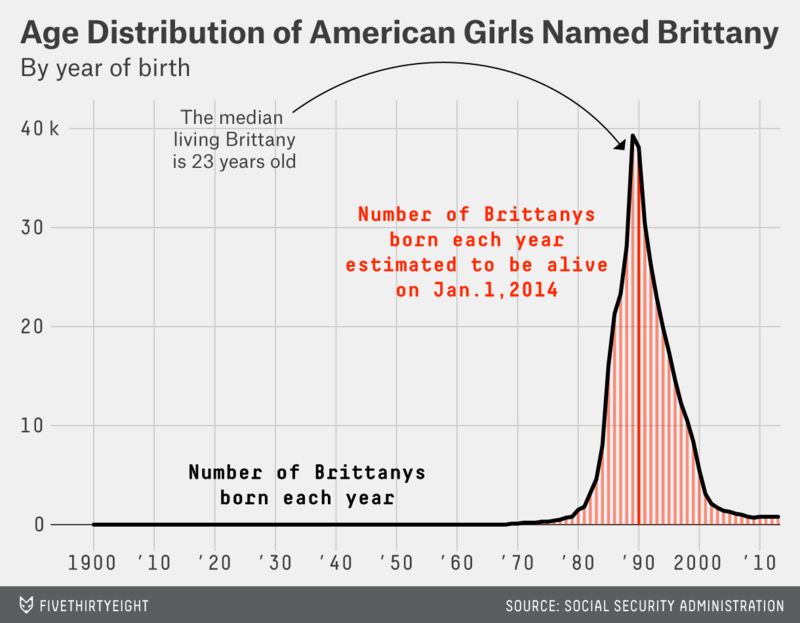 We assumed that these extremely uncommon names represent 1 percent of the total of all births. We also assumed that, when a name/gender combination was missing in the SSA’s data in a given year but appeared in a prior or future year, there were two babies registered with that name (rather than zero), since the actual number may have been anywhere from zero to four. The actor’s given name is Leonardo.